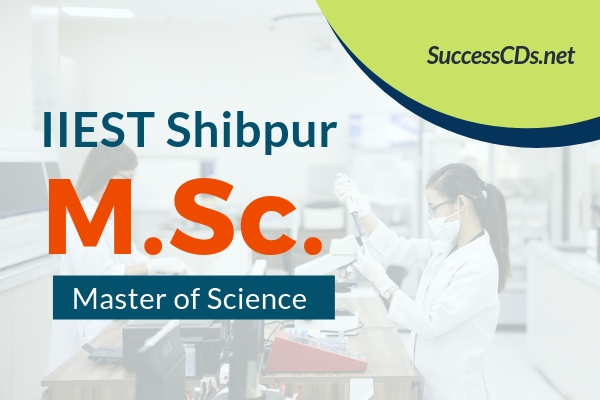 IIEST Shibpur MSc Admission 2019 - Indian Institute of Engineering Science and Technology (IIEST), Shibpur, has released notification for admission to the full time Master of Science (M.Sc.) Programs for the academic session 2019-20. IIEST, Shibpur represents a new class of institutes dedicated towards offering post-graduate programs and advanced research, as recommended by the AnandaKrishnan Committee. Note: (i) The same number of seats are available through CCMN 2019 (ii) The seats left vacant after CCMN 2019 admission will be filled in from the wait listed candidate of our admission process. B.Sc degree (3 yrs/6 semesters) with Physics as Honors/ Major subject and Mathematics as one of the subsidiary subject of 2 yrs/ 4 semesters duration. B.Sc. degree (3yrs/6 semesters) with Chemistry as Honours/ Major subject and Physics and Mathematics as subsidiary subjects of 2 yrs/ 4 semesters duration. B.Sc/ B.S degree (3 yrs/ 6 semesters) with mathematics as Honours/ Major subject. B.Sc degree (3 yrs/6 semesters) in biological science as honours /Major subject and Chemistry as one of the subsidiary subject or B.Sc degree ( 3 yrs/6 semesters) with Chemistry as Honours/ Major subject. A minimum of 60 % marks (CGPA= 6.5 on a 10 point scale) for OC/EWS/OBC (NCL) category candidates and 55% marks (CGPA=6.0 on a 10 point scale) for SC/ST and PwD category candidates in the Honours/ Major subject mentioned in the table. Candidates appearing in the qualifying examination may also take admission, if selected. However, they must submit the certificates, mark-sheets and other documents meeting the eligibility criteria within failing which their candidature will be cancelled.